No matter the size or type of building, fire detection and fire suppression are extremely important. Even if you are insured against fire and subsequent loss, your insurance company may compensate for loss of equipment and building structure, but nothing can restore the loss of precious lives. The advantage of time is the ability to prevent unnecessary loss and minimise interruptions of business continuity. 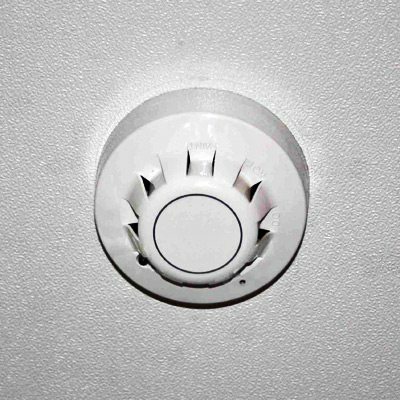 An automatic fire detection and alarm system generally provides a network of manual call points, fire sensors and alarm warning devices over the area covered. It allows one to constantly monitor the building and warn if a fire breaks out, or is suspected. When a fire disrupts your business operations, it causes substantial and unnecessary financial loss. The use of most common fire fighting extinguishment such as water, foam or dry chemical can cause greater financial loss than the fire. Often downtime outweighs the loss of equipment and structure, hence the importance of selecting the correct suppression systems. 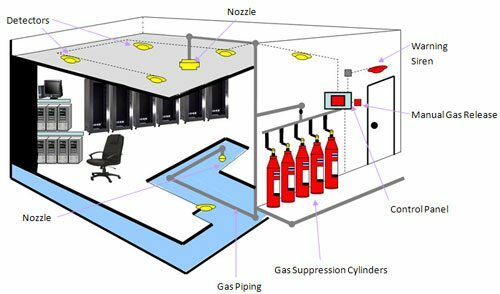 Carbon Dioxide (C02) Fire Suppression gas has a high ratio of expansion which facilitates rapid discharge and allows for three dimensional penetration of the entire hazard area quickly. Carbon Dioxide extinguishes a fire by reducing the oxygen content of the protected area below the point where it can support combustion. Carbon Dioxide has no residual clean-up associated with its use as a fire suppressing agent. When it is properly ventilated, the gas escapes to the atmosphere after the fire has been extinguished. CO2 has been effectively applied to protect areas such as transformer rooms, archives, electrical hazards, record stores and computer rooms. However, this should only be installed in unoccupied areas. FM-200 Fire Suppression agent doesn’t leave behind any oily residues, particulates, water, or corrosive materials, and hence does not cause collateral damage to valuable property, sensitive electronics, or whatever you need to protect. FM-200 does not deplete stratospheric ozone, and has a minimal impact on the environment, especially when compared to the impact of a minor fire. FM-200 Systems reach extinguishing levels in 10 seconds or less, stopping ordinary combustible, electrical and flammable liquid fires, before they cause significant damage. When fire is extinguished this quickly, it means less damage, lower repair costs, and extra margin of safety for people. It also means less downtime and disruption of business.